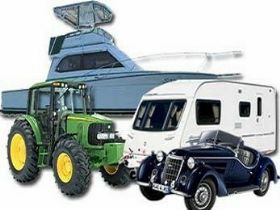 Extreme Batteries imports and markets the Odyssey range of batteries for cars, trucks, motor bike and marine applications. The Odyssey battery range has a guaranteed longer service life. With a 10-12 year design life the Odyssey battery will easily last 5-8 years in automotive applications as long as it is kept correctly charged. In a cycling application these batteries will deliver 400 cycles when discharged to an 80% depth of discharge (DOD). The Odyssey battery range also offers superior cranking and fast charge capability. The cranking power of Odyssey batteries is double to triple that of conventional batteries, even at extreme cold temperatures. Also, if constant voltage charging is used, no limit on the charge current is necessary and these batteries can be brought to a very high state of charge in less than an hour. The Odyssey battery range also provides for mounting flexibility. Your Odyssey battery can be installed in any orientation; it does not affect any of its performance characteristics. However, inverted installation is not recommended. The Odyssey battery range is engineered for superior vibration resistance. Odyssey batteries are of military grade materials and have endured rigorous tests that demonstrate their overall ruggedness and exceptional tolerance of mechanical abuse. All Odyssey batteries are shipped fully charged. Simply install it in your vehicle if the battery voltage reads 12.65V or higher and you are ready to go. A voltage reading less than 12.65V will need a boost charge prior to installation. For optimum reliability a boost charge before installation is recommended, regardless of the batteries open circuit terminal voltage. 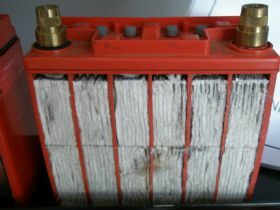 The absorbed glass mat (AGM) valve regulated design of the Odyssey battery means there is no acid to spill out and cause acid burns or damage to expensive paint and chrome. Because of the starved electrolyte design the US Department of Transportation (USDOT) has classified the Odyssey battery as a dry battery. Shipping an Odyssey battery by express ground or air is possible. The Odyssey battery range has superior shock and vibration resistance. 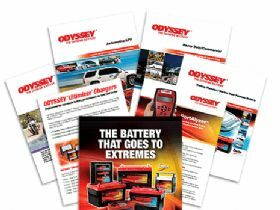 Odyssey batteries have passed a variety of tough domestic and international shock and vibration test standards. The Odyssey battery range offers customers longer storage life. Unlike conventional batteries that require a recharge every 6 to 12 weeks, the Odyssey battery can be stored for up to 2 years at 25C (77F) from a fully charged state. These batteries can be stored for 2 years or when the open circuit voltage (OCV) drops to 12.00V, whichever comes first. Deep discharge recovery is another benefit of this range. The Odyssey battery can easily and repeatedly recover from deep discharges. Conventional SLI batteries have extreme difficulty recovering from similar situations. No catastrophic failure with this premium product. Unlike conventional SLI batteries your Odyssey battery will not fail catastrophically. If you are sure the vbattery is fully charged and yet it cranks the engine slower, you should get the battery replaced at the first opportunity. 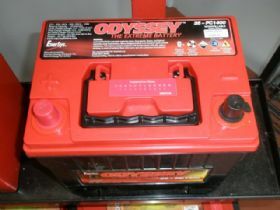 The Odyssey battery range provides the Industries best warranty. Depending on your application (powersports, auto-motive, etc.) Odyssey batteries offer up to a 4-year full replacement warranty or within 400 cycles to 80% depth of discharge, whichever occurs first. Since the actual warranty offered can vary with your geographical location, please check with your Odyssey representative for the warranty specific to your application. 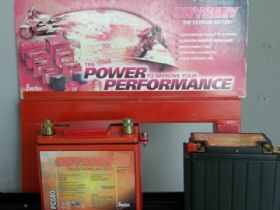 If you re interested in the Odyssey battery range give Rod a call on 03) 9735-4317.